Yeah, this is the first post for about three months. Short version is I took a break from social media to fix real life stuff, get well, re-evaluate what I want to do creatively, and make some resolutions. 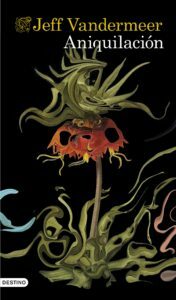 One of those resolutions is to actually design and run some of the games we’ve talked about over on Fictoplasm; and one of those games is Annihilation/Southern Reach, using Cthulhu Dark. 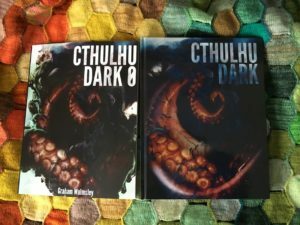 The standalone Cthulhu Dark is a massive expansion on the original seven page appendix in Stealing Cthulhu. 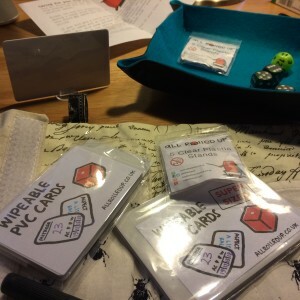 Not much has changed mechanically, but there’s a lot of added value in the Keeper’s section on writing and refining mysteries, how to play, and the new settings that make the bulk of the book. Very simple mechanics (one die automatically, one die for expertise plus the Insight die if you risk your sanity). This is good; I don’t need the full gamut of CoC’s attributes and skills to run a one-shot horror game. And finally, the section on Mythos threats with a couple of themes, creeping horrors, and locations for each. Unsurprisingly this feels a lot like a stripped-back Stealing Cthulhu (and that’s a good thing). I’ve been keen to cover Annihilation since we talked about it in S2E4 of Fictoplasm. Rather than recap here in detail I’d say listen to the podcast or better still read it first (it’s only a couple of hundred pages long). Also Alex Garland’s film of the same name will be out on Netflix this month, apparently. I reckon Annihilation has a lot to offer Mythos fans, and more to the point it’s a great fit for Cthulhu Dark which in many ways is a successful return to the fundamentals source material of Lovecraft when the Call of Cthulhu RPG surpasses Lovecraft as its own, distinct genre. The other nice thing about Area X is its ambiguity; it has a few loose principles expressed subjectively to the characters in the books, enough to work with in a game without choking the plot with canon. This is the Southern Reach’s ninth expedition into Area X. You don’t know each other’s names, only vocations. Your equipment is outdated and careworn. Your memories are unreliable, and paper journals tell you where you have been. Some of you are studying the landscape, others are studying your team-mates. All of you are looking for answers in the wild coastline, and hoping you can get back without losing too much of yourself here. Oh, and check out the Spanish translation’s cover of Aniquilación, from this article. Reworking a thing I did a couple of years ago. Originally it was inspired by The Seclusium of Orphone of the Three Visions, but considering society as a vehicle for magic. Magic is feared/forbidden/evil. Magicians are separate from human civilisation. The Divine is separate from Earth. Humans pay dearly for venturing outside. The magician walks into the Earth to connect with human communities, seeking disciples. Magicians as Gods/Divine Spark on Earth. Human communities in balance between their civilisation and liminal elements of their community (fair folk, ghosts, myths). Wise women and cunning men. Human civilisation realises a taxonomy of magical and Divine elements; seeks to categorise, gain control over. Humanity divided between minority of powerful sorcerers and majority of peons. Humans, not the Divine, decide who is worthy of Magic. The human majority take back power from minority gatekeepers. Individuals find new ways to do magic outside prescribed methods. Freedom to conjure. Humanity mistrusts magic. Earth is purged of self-serving magic. Magicians withdraw wholly to the realm of the Divine. My first Dragonmeet happened. Highlight was the announcement of Seven Wonders, and even better the con-only print run sold out by lunchtime! An eclectic mix, but a nice spread of OSR and storygame type stuff, plus All Rolled Up’s fantastically useful accessories. Colours don’t get a treatment in my 4th edition CoC, and tend to get glossed over in favour of tentacles (they don’t make any of The Good Friends’ top three, for example). The Lovecraftian Science blog dissects the origins of Colours nicely and appeals to me as a scientist. Quantum life-forms would not be out of place in Star Trek, either. The Corruption trope is (like Cosmic Horror) seductive in an abstract, all-encompassing way — we love the stench of Chaos in the Warhammer universe, for example, and the way it perverts the natural. Since the Colour is more dreamlike than horrific, the final horror is probably a victim of the Colour, rather than the Colour itself. Putting a human context on horror is essential for it to be horrific; without that, it’s weird science fiction — or in other words, horror is sensation, sci-fi is genre. 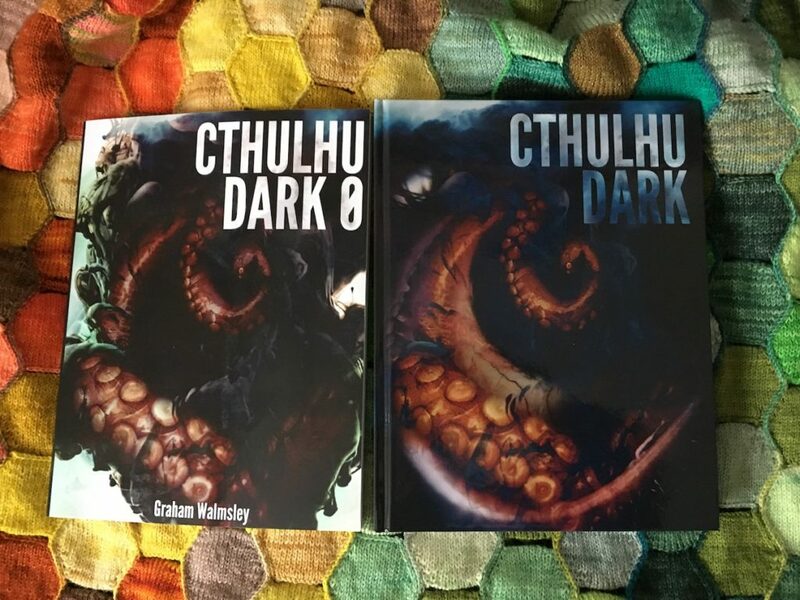 And while Lovecraftian roleplaying has moved into the realm of pulp with Dark Young being answered with shotguns, the Colour remains nihilistic and faithful to Lovecraftian sensations of alien wrongness, promising a thoroughly miserable gaming experience. That’s a great monster. 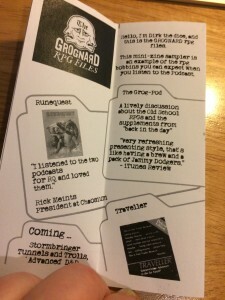 The other Dragonmeet find was The Grognard Files who were promoting themselves with a neat little booklet and also plugged by Scott Dorward. I’m pleased to add them to my subscription to UK RPG podcasts. I guess the appeal will be limited to gamers of a certain age, but with the US-centric OSR it’s nice to have a British perspective on gaming nostalgia. 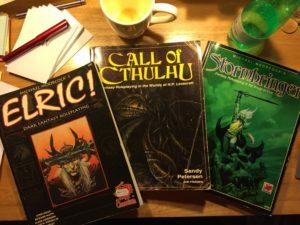 If you want a run-down of the history of Runequest, Call of Cthulhu and others (I can’t wait for their take on Stormbringer) in the British RPG scene from the early 80s onwards, it’s recommended. 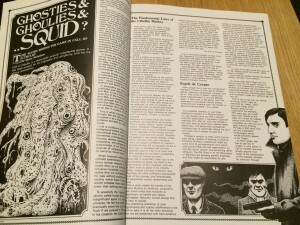 Their second podcast features a Call of Cthulhu retrospective, and name-checks several White Dwarf contributions including The Horse of the Invisible from WD66 and Ghosties, Ghoulies and Squid by Simon Nicholson from WD91 (July 1987 — just before White Dwarf’s peak and sharp decline). And so on. Nicholson also differentiates between the Derlethian (black and white) vs Lovecraftian (shades of grey) outlook. 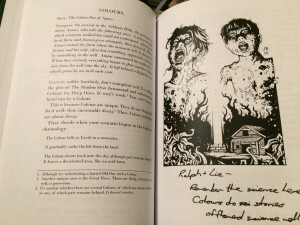 He does call Lovecraft “an athiest, materialist, and nihilist” (implied but by no means proven), “not a great writer… his characters were two-dimensional at best” (a matter of taste), and maintains that the horror in Lovecraft’s tales comes from a bleak, nihilistic vision (I don’t agree). 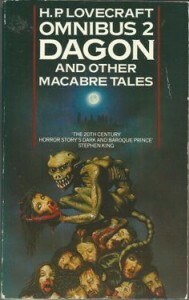 But Nicholson also recommends taking conventional monsters (vampires, werewolves, ghosts) and regarding them — and magic — from a scientific point of view, which is a great piece of advice espectially looking forward to the 90s where contemporary urban horror fantasy becomes the mainstay of gaming and characters have access to scientific techniques and seek explanations (arguably my Department V game was more Lovecraft than World of Darkness, with its focus on alien forensics). With that in mind, I think it’s fair to mention Ghosties, Ghoulies and Squid in the same breath as Stealing Cthuhlu. 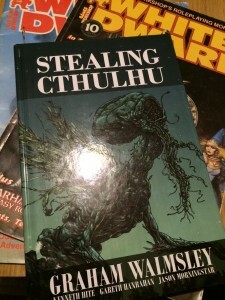 Walmsley’s book is more mature — as you would expect, with 30 years of collective experience in Call of Cthulhu as a roleplaying exercise, and the ways the narrative may be subverted. Both works advocate deconstruction of the genre, getting back to the fundamentals, the expectations of players and how to subvert them. Just as Silent Legions deconstructs the elements of Lovecraftian (and other horror) worldbuilding, these texts are a critical eye on the elements of the Lovecraftian narrative. Cthulhu as a pulpy tentacled monster is indisputably played out; but Lovecraft as a genre still has legs, and the analysis in Stealing Cthulhu and Ghosties, Ghoulies and Squid are the kinds of discourse that keeps it fresh, peeling the genre back to the authorial intent and fundamentals. This kind of deconstruction is what enables new ground to be broken in the Lovecraftian genre with games like Lovecraftesque. Just don’t call it horror. Horror is an emotional response; this is science fiction. In any other game a starship’s crew will look upon the pulsing nuclear chaos of a black hole with wonder, not horror. They will transplant their consciouses from one body to another in transhuman societies, without a thought for what this means for their identity. They will accept that the universe is vast and contains many other races, for whom Humanity is an irrelevance. The first spell I encountered playing CoC was Brew Space Mead; the idea that a traveller could reach distant worlds in the arms of a byakhee or star vampire filled me with curiosity, not dread. Call of Cthulhu is a great fantasy game, a great sci-fi game, a great pulp adventure game, and crucially a great investigative game. It is a terrible horror game. Let’s qualify “terrible”. The enduring power of the Lovecraftian mythos is Cosmic Horror. The sheer scope of cosmic horror makes it a terrific high concept for the GM and author and reader, incredibly seductive as a backdrop. But (I’m going to stick my neck out here) thanks to that scope it’s almost impossible to translate that to the RPG table and call it horror. It’s too far away from any human context to be horrific. So, CoC (and stablemates) have a reputation on delivering horror on this grand scale, a nearly impossible task in practice. I’m not talking about the horror genre, I’m talking about the emotional response. This is the Paranoia fallacy that because a game is purported to be darkly comedic or horrific, it will elicit that emotional respose. CoC’s mechanism for tackling fear and horror is Sanity, a one-dimensional resource that lacks subtlety or empathy (or respect for mental health issues). More to the point, it doesn’t really reflect the bleak, nihilistic horror that the setting promises — just a slow spiral into subjective madness punctuated by periods of loss of control. Of course CoC at the time was working with the best tools available. 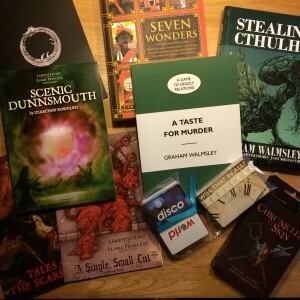 Chaosium’s model was to provide adventures, and that’s where the visceral and spooky thrills would be baked in (much like LofFP does now). Outside of that, CoC was a book of weird monsters and spells, fine for pulp science fantasy but it’s a mythology, not horrific in itself. And as far as I can see 7th edition doesn’t change this formula. Unknown Armies has a much more sophisticated take on deterioration. There are five scales of Madness (Self, Isolation, Violence, the Unknown, and Helplessness) but the genius is not only that PCs can become subjected to different stresses with the usual deleterious effects — they also become hardened to them to the point that they become unfeeling, ascetic, joyless agents of chaos. This is Vampire’s Humanity in reverse. This is also a very objective way of looking at things, and objectivity is what makes the nihilistic view horrible. It’s a slow battering down of all the defences against that crushing certainty — all of the mechanisms of family and relationships, societal norms and faith in order being stripped away. It’s delicious. 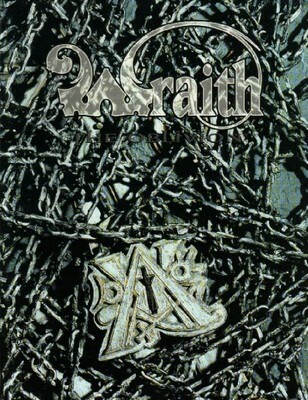 The other game is Wraith, a much looser and much more subjective and personal view. Wraith’s high concept — the idea that the afterlife is no more than a slow decline, waiting to be consumed by Oblivion and feeding off weaker wraiths, sometimes clawing your way back to the living — gives the Lovecraftian cosmic worldview a run for its money. Wraith isn’t as mechanically tight as UA but its use of Passions and Fetters — the former being diminished by harrowings — gives a context for the character’s place in an uncaring cosmos. Passions are the defining emotional ties of the character but can be stripped away by Spectres, neglect, or by the environment itself; they rarely get stronger. Hope is a slender thing. This is a nihilistic storygame about the end of life. I recommend a Lines and Veils conversation up front, as is best practice. This is a game about looking back over the life of someone and examining all the ways they’ve touched people, the things they’ve built, and the ideas they’ve had. For as many players as you like, it doesn’t really make any difference. Your principal is old, but they have accomplished much in their lifetime — they have touched many people, had grand ideas, built great things. They are in a place they call home, safe for now, with time to reflect. Describe their house. Is it in the city or the country? Which country? Write the answers to the above on an index card, then go to Step Two. When a card is drawn, both the suit and the number may be used. See below. A player takes the deck of cards and draws one, placing it in the middle of the table. With the suit in mind, the player to their right describes an object that exists in the principal’s house. Write it on an index card. The next player to the right explains the significance of the object — what event, relationship, place or idea, and who or what it affected. Add that to the index card. The next player to the right then explains how that achievement ultimately amounts to nothing in the bleak and baleful eye of an uncaring universe. The numbers on the card are a guide (see below). Add the text to the index card. Continue for as many rounds as the players can be bothered. The first player to say “sod this, what’s the point” ends this phase, and has to make the tea. Hearts are about love, emotions and relationships with the principal. Diamonds are about the principal’s imagination; ideas and concepts that have been adopted by others. Clubs are about physical things that have been constructed (directly or indirectly) by the principal. Spades are about people (cultures, groups) that have been influenced by the principal. J, Q or K: describe a pastiche on another world or dimension. It should be brutal, alien, or unfair; it shows how the achievement is ultimately irrelevent. Ace: Wild card. This card allows the player to retcon any one narration into something life-affirming and optimistic (if an Ace is the first draw, hold for later). For more optimism, add Jokers with the same function. For less optimism, take the aces out of the deck. This chapter is split into three areas. The first is what kind of games you might want to run in this hybrid setting. The second is about power levels and how they may (or may not) upset the usual power balance in vanilla CoC (if there is such a thing). The last part is using the resources already at your disposal. My game was always intended to be CoC-style invesigation, just in a weirder sort of earth. As such it faces the question that all CoC games face: if the investigation is so dangerous, if the secrets come at such a high price, what drives the investigators on? The rewards within the system such as expanding your Cthulhu Mythos skill are a double-edged sword. In a lot of cases the investigators band together for metagame reasons, e.g. if they didn’t work together, there would be no game. That’s OK; we’ve all had good times playing CoC which characters whose dedication to the investigation is completely implausible. However it’s better practice to give the players a real motivation for getting stuck in. The Mabelode Commission are a peacekeeping force in Boston around 1923. They exist to keep the peace between the human population and the Melnibonean gated community, and (secretly) to investigate breaches of the Old Ones (“Old Chaos”) into civilisation. As the name hints they are answerable to Mabelode directly. This is the classic “squad” organisation of play, where the characters have a common goal and are expected to work together as a team. Ron Edwards is critical of this style in his Annotated Sorcerer — certainly it doesn’t work for Sorcerer, but he also opines that it generally produces boring characters and that “imposed team identity isn’t what makes a superhero group”. This may be the case, but we have plenty of examples of an ensemble cast in fiction working together yet establishing their own identities. The main issue will be “why don’t the characters just quit?” which is the problem with all CoC games anyway. In this one you can assume that, as Agents of Mabelode, each character does not have the option of quitting, though this could be something they work towards (e.g. by accumulating enough points of Lawful allegiance that they can annul their ties to Chaos). 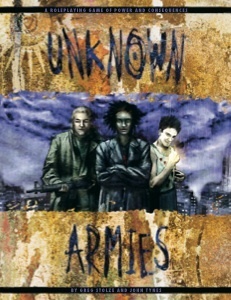 This game could be equally investigative and pulp-y; particularly if the characters are loaded up with Demons of Combat and other magical powers that help them do battle with Chaos. “Death by SAN loss” should be even more of an occupational hazard than in normal CoC, as the party are forced to interrogate tomes and face whatever SANity blasting monsters they encounter. The principle enemies will most likely be cultists waging a secret war against the Church and intending to bring about some kind of End when the stars align. No change there, then. Dreaming Spires is a campaign set in Oxford, whose ancient name is Imyrr. This is a little more traditional with the party made up of academics, professionals and local peacekeeping forces. Oxford is a place literally half within a dream world; the Dreamlands (CoC) and also the Dream Realms (for Mongoose’s Elric of Melnibone) may become useful sources. With the constant flow of both academics and nobles into the city there’s plenty of opportunity for the characters to interact with various strata of society. The longevity of the Melniboneans allows all sorts of historical characters into the campaign, and perhaps even act as the PCs’ patrons. In addition there are options for explorations into the various corners of the earth. Finally, a seat of learning is a nice setting where PCs can plumb depths of forbidden knowledge, getting themselves into all kinds of trouble with the Church and going insane into the bargain. To put things in perspective, a fairly low-level demon weapon may add 5d6 damage, so a single blow could do more than 20 points. That’s enough to do for a Hound of Tindalos with a lucky roll, and a few blows will start to annoy Shoggoths and Star Spawn. The early Stormbringer does have a problem with balance between PCs (i.e. there was no balance), but this is mainly thanks to the lottery that is character generation. If the players are working for an Agency that bequeathes them magical (demonic) items, power levels should be easy to control. In any case Demons should be rare and demon weapons rarer still. The more complex campaigns may require some thought to weave the Moorcockian motifs into the setting, but a lot of printed CoC adventures are fairly neutral in their premise and should be easy to wind into the plot. There’s not much to say about this other than the printed adventures from Chaosium and in particular CoC are high quality with handouts galore. A lot of the CoC adventures will assume a mixture of professions and will concentrate on technical skills like Psychology, Archaeology and Library Use. These skills, and the professions in CoC should still be relevant in the alternate 1920s. With the exception of various Allegiances and the chance to learn Sorcery, things shouldn’t be that different. Who are these God persons, anyway? See? No gods, just Law and Chaos. No God-founded origin for Earth. It just is, in the words of Jhonn Balance. Our fantasy pantheons have always suffered from bland humanisation, and unfortunately all of the RPGs based on Moorcock continue this tradition. And at this point we should acknowledge that yes, Moorcock’s deities do appear as human, for the most part (yes, I know Pyaray is a tentacled whisperer of impossible secrets, but he’s still presented in a very human context — laying claim to a sunken fleet of humans). But they are Lords. Arioch is a Duke of Hell. He didn’t build the place, he just lives there. There will be no quicker way to underline the weirdness of this alternate 1920s than to hilight the many cults that people attach themselves to. Law, Chaos, Beast Lords or Elementals — everyone wants to belong, to show that they’re a member and their cult is better than yours. It should be subtle but ever-present — tie pins and fascinators with Chaos symbols, glyphs on doors, even the appearance of demons in public. Lovecraft and Moorcock’s approach to deities may seem diametrically opposed; Lovecraftian entities are unknowable, horrible monsters for whom Humanity is irrelevent, and Moorcock’s Lords are supremely interested in perpetrating a cosmic “great game” with humans as their pawns. Or to put it another way, in Lovecraft humans spend all their effort trying to attract the attention of higher powers that do not care, and in Moorcock the higher powers spend all their time trying to attract the attention of humans who are at best a bunch of secular opportunists and only in it for the demon summoning and communion wine. Ho hum. Gods in the Elric’s society feature in daily life, almost as if they were local personalities. There is no faith; temples to the different Lords of Chaos exist where one may make direct appeals and be answered. The ensemble of godlings reminds me of Shinto, in that it’s a collection of local mythologies rather than a cohesive pantheon. This is certainly the case when the likes of the Elementals and Beast Lords are on an even footing with the Dukes of Hell, and the extent of their power mainly comes down to territory. Furthermore Moorcock’s books emphasise the direct relationship the gods like to have with humans. Maybe not just any humans — Elric is the Eternal Champion, after all — but for all their caprice they’re potrayed as being fairly understanding of humans. 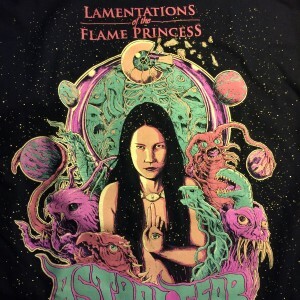 I prefer to think of the Lords of Law and Chaos as more like the sons and daughters of Amber; they are allied to one of two cosmic forces, and they are fantastically powerful and are able to exist in multiple versions of reality, possibly simultaneously. But they’re not gods, they’re magicians. In Elizabeth’s Empire there is virtually no separation of church and state. 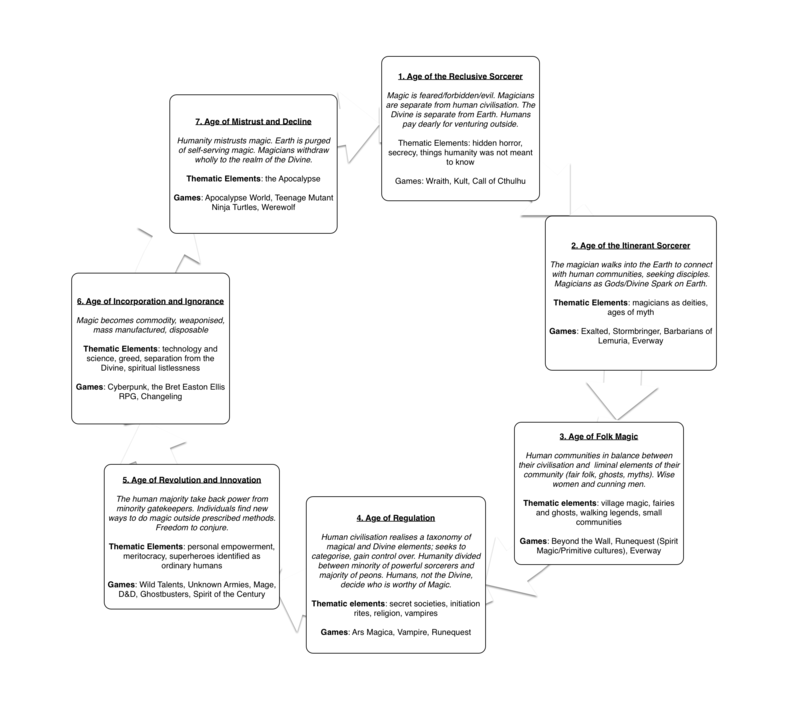 The Lords of Chaos are political positions; they are the Variable Eight Lords who are appointed by Elizabeth herself, and bear grandieuse titles like Lord Arioch, Lord Slortar, etc. Whether actual gods or human pretenders (at the moment it’s ambiguous) they’re clearly powerful entities but also in touch with the human population, and they hold a seat on Elizabeth’s council for as long as it suits her whim. The Variable Eight and the Church of Chaos also has local representation. In any major city the Gods are represented, and priests act as the mouthpiece for Arioch and the other gods when worshippers seek his council. Whether this is just a metaphor (q.v. Catholic absolution) or the ability to channel the mind of the actual Duke of Hell is up to you. Certainly there’s a lot of ceremony involved, and while the priest is channeling Arioch they are assumed to be Arioch. But, it could be trickery. There’s a lot of that about. In the Young Kingdoms the representation of gods is even more corporation-like, with the various Dukes as CEO of each Church. Each competes with the other for the most devotion from the population; at the same time the population will worship whatever Lord is appropriate for the occasion, and will freely mix it up between Law and Chaos as well as the more primal deities. Religion is a free market. Of course when the existence of gods is proven, and when they function as politicians and service providers, worshippers expect something in return. The Stormbringer/Elric! RPGs mention the ability of PCs to become Agents of deities. In 4e Stormbringer Agents are placed above priests and have literally promised their soul to the deity. They get to try Divine Intervention and they get a special amulet/decoder ring/mcguffin that keeps them in contact with their deity. This gets watered down a bit in 5e/Elric! where Agents are just on the payroll and get financial reward for doing the work of Law/Chaos. 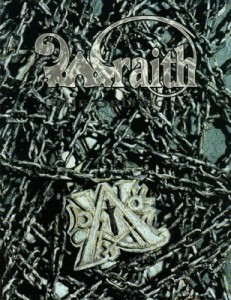 As mentioned earlier I favour the Elric! style of separate ratings for Law and Chaos (and the Balance) over 4eSB‘s “Elan”. I do prefer the latter’s approach to Agency and control, however — including the amulet schtick. As for actually giving up one’s soul — how would you tell? Whatever you choose, suitable rewards for serving could include money and status (a contextual boost to Credit Rating similar to the benefits of being high born), spells/demons/magic items, even divine intervention and other powers. Elric! has a nice section on benefits of being a Champion, though the epic scale may not quite fit with the low-key nature of an investigative game. Cults of the Young Kingdoms (Mongoose) has a long list of gifts and compulsions, though I don’t really like the “taint of chaos” effect (a la Warhammer FRP) that it exudes, as if being an agent is like contracting an infection. YMMV. One important note: Agents need handlers. Put them in touch with their supernatural masters (either via a mouthpiece or direct visitation). The point of being an Agent is not the free stuff, it’s the being in someone’s secret club and doing their shady jobs. It’s not entirely clear if Agents are supposed to be out in the open, or a secret force. The notion that each Church of Law and Chaos has a secret police fits right in with the political and corporate setting. Whether these “agents” wear their allegiance like a badge, or it’s just rumoured, or even secret is a decision for the GM. Personally I favour the middle option. Speculation about allegience adds to the paranoia. Now, let’s tackle the 80 tonne shoggoth in the room. CoC is a game where humans leave their safe cocoon of humanocentric beliefs and realise just how uncaring and frightening and alien universe is. This means that however unpleasant, depraved or unfair the various gods of Law and Chaos are, they are the norms that humans insulate themselves with. And, there is something worse. The broader mythos includes Outer Gods, Elder Gods, Other Gods, and Old Ones (Great, and not-so-great). In the Post-Lovecraft mythos the Elder Gods are pitted against the Outer Gods and are generally considered slightly less awful than the Outer Gods. The RPGs (e.g. CoC and Trail of Cthulhu) are a further source of confusion (4e CoC calls Nodens an Outer God… but different; ToC calls Nodens an “Elder One”). But whether these Outer/Elder gods really are at war is irrelevant, at least on that cosmic scale; humans don’t matter to them. Hereafter I’m going to lump them into a single category of Old Ones and hope for the best. The Old Ones are an original pantheon, and their power (“hell”) was usurped by the Lords of Chaos. Elric was an Old One, but the usurpers foiled his plans before he could bring his weapon to bear. Elric was a sorcerer, and challenged the power of the Old Ones with his weapon; he managed to deploy his weapon before they could stop him completely, and the result was that both he and the Old Ones were banished from the Earth. The various Lords of Chaos then occupied the power vacuum and set themselves up as the new pantheon. The Lords of Chaos and the Old Ones are one and the same; Law and Chaos as personified are simply the acceptable face of the Old Ones. For some reason the Old Ones felt the need to remodel themselves and hide from humanity. Elric is either a renegade who was punished, or the Horn of Fate is irrelevant and he slumbers along with the other Old Ones. Option 3 is the least appealing to me — I’d rather keep them as seperate entities — however it could work if the Old Ones need humanity to rend the veil of time and space and bring them back to the Earth, and in the meantime need a way of communicating with the population without driving their followers completely insane. There is the potential for institutional politics where the majority of the Church is unaware of its origins. What about Law and Chaos itself? I don’t believe the Lords of Law and Chaos actually are those forces; they’re just opportunistic godlings who have allied themselves with one side or the other. But the description of a “monstrous nuclear chaos beyond angled space” (Lovecraft, The Whisperer In Darkness) is fitting and inclusive of both Chaos and Law, as immutable primal concepts. This would mean that the Old Ones et. al. are simply the older beings who gravitate around these concepts and the descriptions of Azathoth and its servitors may be allegorical. Or maybe not. Whichever version we choose, the humanocentric Churches must be aware of the Old Ones on some level. The situation is unchanged from stock CoC except now we have a public and organised religeon who are fully aware of the tenuous situation the mortal civilisation is in, and not only that, they almost certainly filter the true horror of Law and Chaos for public consumption. The best the Churches can hope for on a spiritual level is to hang for as long as possible, which means they will have strong motivations to both keep the existence of the Old Ones from the public while tackling their attempts to break into reality in secret. You can’t have a Stormbringer-style setting without overt magic. But you can’t have CoC without magic being dangerous and esoteric. If myth and the nature of Law/Chaos are being filtered for public consumption, it stands to reason that the same is being done for Magic. Magic is an apolitical esoteric science that can cause great harm in the wrong hands; for this reason magic is probably licensed for use. Depending on which ruleset you wish to follow, there are various ways of drawing the line between regulated and illegal magic. Stormbringer 1e-3e use demons to express magical power exclusively, and these are divided into categories such as “Demons of Combat”, “Demons of Knowledge”, etc. Later versions take a toolkit approach to demons, add spells, and all sorts of other items. CoC has its own spells, many of which are predicated on summoning and controlling things. I prefer to abandon the minor, magic missile style spells that crop up in Elric! and make demons the only “legal” source of magic. Demons are a kind of container or filter for raw magical energy; the formation of that filter is by state-approved manufacturing processes. By comparison casting spells directly is irresponsible and dangerous, and therefore illegal. So, choose whichever demon creation method you like (I mostly prefer the earlier approach) and make that available to PCs, and make the CoC spells “raw” magic. That’s not to say the other forms of magic in the games don’t have a use. The various runes and glyphs from the Bronze Grimoire are cool, also. But the message is that for magic to be safe, it should be packaged for consumption by a regulator. In this portion of the game notes, we’ll discuss history and myth. It was as if some enormous sun, thousands of times larger than Earth’s, had sent a ray of light pulsing through the cosmos, defying the flimsy barriers of Time and Space, to strike upon the great black battlefield. When Elric blew the Horn of Fate, a rent in time and space allowed the Gods of Law to pass into our world and do battle with Chaos. Eventually the power of the Horn swept all gods away and ushered in a new age and new world. At least, that’s how the common version of the myth goes. As Moorcock fans we’re familiar with the events in Stormbringer up to the point of Elric’s final toot of the horn (and subsequent betrayal by the eponymous sword) and it’s generally assumed that the world that follows is both geographically and metaphysically altered into our own world. The alternate earth of Elric of R’lyeh exists after that cataclysm; the Elric myth is broadly aligned with the events of Stormbringer, but it is still a myth. The cataclysmic event at the beginning of the Common Era is the beginning of known history, and the time before is speculation — and the Elric myth is probably a rendering down of a complex series of events to make it palatable to modern citizens. But, let’s consider what could have happened. Firstly, the Horn of Fate is a macguffin. It could be a metaphor for vast cosmic change, or it could be a coincidental detail that has been blown out of proportion. What if the sound of the horn was the “thin, monotonous whine of blasphemous flutes from inconceivable, unlighted chambers beyond Time” (H. P. Lovecraft, Nyarlathotep) and Elric’s true purpose was to summon Nyarlathotep to usher in a new age? Another idea: what if the Horn of Fate were a weapon? Its intent was to usher in a new age, reset the balance and sweep the old gods away. When Elric sounded the Horn of Fate and conjured the gods, what if they came there not to do battle with Chaos, but — facing their own extinction — with the sorcerer himself? And finally, when the Horn was sounded for a third and final time, did the Earth change, or did Elric’s perception of the Earth change? Did he truly witness the Earth whirling “faster and faster… day giving way to night with incredible rapidity” (Stormbringer) or did Dead Elric dream those changes after his final battle ground sank beneath the waves? Elric is popularly portrayed as mortal, yet he is also Melnibonean; he is both fantastically long-lived and powerful, and there is no-one in the Common Era who is truly Melnibonean, and thus his true power is likely beyond the estimation of modern scholars. That he lives still is a frightening possibility. Ylrhc the sorcerer created a weapon that could challenge the gods themselves, and for his blasphemy they met him in his palace at R’lyeh to strike him down. He was defeated but not killed, for he did the gods terrible harm and weakened them such that even they could not end him. And so the gods consigned his R’lyeh to beneath the waves, along with his weapon, so men would never find him and understand that they had the power to challenge the gods. Ph’nglui mglw’nafh Ylrhc R’lyeh wgah’nagl fhtagn! There’s not a lot to say about mucking about with history. It falls down to two things: inserting historical figures into your game, and establishing a timeline. Let’s talk about historical figures first. 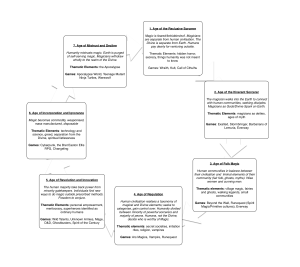 Melnibonean bloodlines present a lot of potential; in my campaign Queen Elizabeth was the last true Melnibonean, and the class structure was predelicted on Melnibonean blood and how many generations one was removed from Her Majesty. The greater the percentage of Melnibonean blood the longer lived the individual is, too. I’ll cover modern society and its obsession with bloodline and status in a later post. With the potential for historical persons having a drop of Melnibonean blood in their veins, there are opportunities to insert any figure you care to from history into the 1920s. But, this is hardly new, since we were doing it in Vampire 20 years ago. History should be made by Melniboneans. Bear in mind that “Melnibonean” is a fluid concept and applies to members of rich families with strong Melnibonean bloodlines — but not exclusively alien. No-one in 1920’s earth is a “pure” Melnibonean, or has any concept of what that would look like — maybe with the exception of Queen Elizabeth. Where it’s amusing to do so, pluck figures from history and give them Melnibonean blood. Pay attention to their relative ages. No-one is older than Elizabeth herself, but having NPCs who were born in the 1700s is plausible. In my own games I inserted Elias Ashmole and various contemporaries of Elizabeth. However I was mindful not to turn it into an alternative Vampire with the players as mere observers to the Elder’s machinations. This should still be an investigation game. This is a sample timeline. In this world the Dragon Isle and Melnibone are both synonymous with The British Isles, and Imyrr is synonymous with Oxford (city of dreaming spires and all that). 0-500 – age of Chaos. Sinking of R’lyeh followed by a power vacuum. The Western Ocean is named the Boiling Sea and becomes impassable for the next 1500 years. Old Melnibonean feudal estates within Britain and on mainland Europe vie for power. End of the Bright Empire witnessed by Maximillian von Becque who founds the Church of Law. At the end of the Age the Church of Law is a significant power in central Europe. 500-1000 – age of the Construction. Church of Law gradually permeates through civilisation, and challenges the Melnibonean estates. British Isles resist influence of Law and is widely held to be haunted by mainland Europe, inhabited by ancient sorcerer-kings and frightened tribes of humans. Capital of the Church of Law established at the ancient pre-collapse city of Byzantium. 1000-1500 – age of Enlightenment. British Isles invaded by William who establishes his United Kingdom and begins the reconstruction of the largely superstitious and Chaos-aligned Britain. This is the Middle Age of Britain, during which time the Church of Law is fully established. At the same time the Court of Chaos is put in place to satisfy (the vanity of) the remaining Melnibonean estates on the island. The southern estates join the alliance of the Church of Law and the Court of Chaos under the British Monarch, though in the far north of Scalland the estates refuse to bow to the alliance and a bloody war ensues which is never fully resolved, only conceded. The Scalls continue to predominantly observe the cults of Chaos and become known as the Lands of a Thousand Cults. At this time the old cities of Melnibone are rediscovered and William arbitrates on the rightful stewardship of the settlements. Oxford is one such city, and becomes a principle seat of learning. Towards the end of this period the collapse of the Byzantine Empire is imminent, to be replaced by the modern European structure. 1500-present – modern age; the Age of Empire; the Rediscovery of Melnibone. The influence of Law spreads as cities prosper and the precepts of Law supplant the old allegiances to the cults of Chaos; however in rural areas local cult worship is common. Queen Elizabeth comes to the throne in Britain after a brutal war of succession following the death of her father, Henry. As it happens this profoundly influences the Balance between Law and Chaos throughout Europe. Had her sister Mary succeeded their father it is likely that Mary would have founded New Byzantium and a second Great Age of Law would have resulted; instead Elizabeth sought a balance between the Church of Law and the Courts of Chaos, and the latter was able to establish itself in the political landscape. This was the great Rennaissance of Chaos, with the rediscovery of the arcane sciences and a resurgence in magic. The British Empire — also known as the Second Bright Empire — is established during this time, and spreads throughout the modern world as far as the New World to the West, and Asiacommunista to the East. The “Romance of Melnibone” is a phrase used for the romantic sensibilities of old Melnibone, the rediscovery of Melnibonean relics and knowledge and a reconnection with the spirit of Melnibone which Elizabeth sees as a continuation of the work of William’s Reconstruction. As part of the Rediscovery, the pioneers of the new Bright Empire travel west across the Boiling Sea and successfully land in the New World. Colonies of the Bright Empire are established there until the war of Independence, where the United States split from the Empire completely. Britain has recently fought a Great War with Germania and won; for the moment there is peace in Europa, though the cost has been very high. Russian revolution leads to the renaming of the Eastern continent as Asiacommunista. Church of Law establishes prohibition in the former Imperial Colonies who now refer to themselves as the United States — though the Empire calls them the Young Kingdoms.